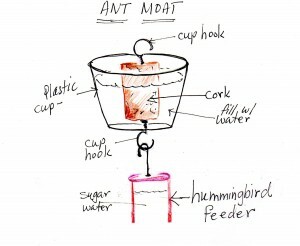 This is a suggestion on controlling ants approaching hummingbird feeders. and can find their way to the sugar water solution if the moat runs dry. You can find the plastic cups from a variety of sources. Laundry soap cups are one good sturdy source. for hummngbirds. The flowers and bugs around your yard provide that. This is a little extra treat. Remember not to use pesticides in your yard. Only use non toxic solutions for some bug control. let the birds, lizards, beneficial bugs and nature do what they know best. You can also purchase hummingbird feeders that are designed which bees cannot approach the sugar water. Do bee kind to the bees and let them have a source for water too and food with your flowers.